It certainly wasn't the electrifying game a lot of people were expecting tonight, but then again, these were the Champions League semifinals and there's a lot at stake to just go out there and play an open game. Manchester City and Real Madrid didn't go beyond a goalless draw at the Etihad in tonight's first leg, but the truth is that is hard to say who comes off the more satisfied with this result. On one hand, the Merengues know that a win at the Bernabéu next week will see them through to the competition's final, but Manchester City also know that they will probably find a lot more space to attack in the second leg and it's going to be extremely difficult to keep them at bay. Against most of this week's projections, Cristiano Ronaldo ended up missing tonight's game due to his thigh injury suffered against Villarreal on April 20, but current reports indicate that he should recover in time for the return leg next week. In the end, it's going to go down as a missed opportunity for Real Madrid. A 0-0 draw away from home isn't the worst result, however, considering Madrid's dominance in the second half, going scoreless is a bit disappointing. Of course, Real Madrid struggled mightily without Ronaldo and there seemed to be no personality in attack, though, the Merengues grew as the game went on. Both teams started off timidly, slowly waiting for a moment to pounce. Zidane opted for a defensive lineup with Vazquez replacing Cristiano Ronado on the flank and the Canterano didn't let his manager down. Real Madrid seemed very concerned about allowing a goal, closing down quickly in midfield and fouling when needed. Man City looked weary of Madrid and apart from a few half chances, it was a largely underwhelming half on the whole. In the second-half Jese came on for Benzema, as the Frenchman didn't look himself in the first half, likely still injured from a few games ago. However, Real Madrid became far more aggressive in the second half, pushing forward and combining well in the midfield. Bale looked dangerous throughout, but couldn't quite find the space to operate. Casemiro also had a strong header saved by Joe Hart's left leg. The best chance of the game surprisingly fell to Pepe in the second half. A shot from point blank ricocheted off Hart's chest from just outside the six-yard box. Pepe held his head in his hands as the ball flew away. Real Madrid pushed on but there were no goals to come. A good showing but in the end and without an away goal to show for their efforts, Madrid are in a precarious position heading into the second leg. - Real Madrid's midfield handled Manchester City's pressure well and looked pretty comfortable. 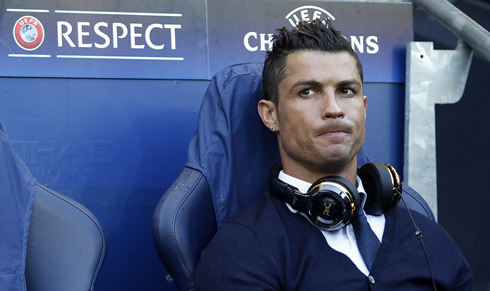 - Without Ronaldo, the attack certainly misses a lot of dynamism. - The defense played well, though, they misplaced passes a few times. - James Rodriguez was an unused substitute which is unfortunate for the Colombian since his creativity could have been utilized. Attackers: Lucas Vázquez, Gareth Bale, Benzema. Cristiano Ronaldo next game with Real Madrid for La Liga is on April 30 of 2016, against Real Sociedad. You can watch Juventus live stream, Real Sociedad vs Real Madrid, Atletico Madrid vs Bayern Munich, Villarreal vs Liverpool, Arsenal vs Norwich City, and Shakhtar Donetsk vs Sevilla, all matches provided from our sports football game pages.